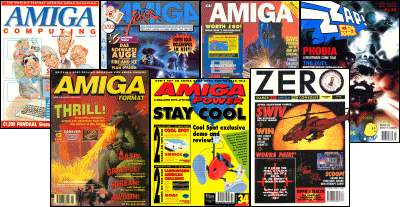 Welcome to Amiga Reviews - a site devoted to the Amiga, its games and magazines that have reviewed them. What is this website about...? I am an avid videogame magazines collector collecting magazines since 1989. Back in 2000 my old mags from the Eighties started to fall apart and I decided to preserve them by converting game reviews to HTML. This website contains 7122 reviews of 2109 games for the Amiga home computer that originally appeared between 1987 and 2000 in seven mags I regularly bought: Amiga Computing, Amiga Format, Amiga Joker, Amiga Power, CU Amiga, ZERO and Zzap! Scroll down to the bottom of this page and relive those memories! This time mainly technical issues were fixed: Foreign charactersets replaced by HTML entities, and missing & duplicate links resolved in the database. Also added reviews of games that appeared very late in the Amiga's life: Abuse, Blockhead, Colonization, DNA, Genetic Species, Powder and T-Zer0. Most remarkable are the many Quake add-ons and compilations in 1998: Aftershock, DeathMatch Disaster, Dissolution of Eternity, Malice, Resurrection Pack, Scourge of Armagon, Shrak, Time of Reckoning and Total Conversions. If you have visited this site before, you may notice it has received a massive overhaul. All pages have been converted to HTML5, hundreds of new reviews are added, and games are now searchable. There is still a lot to be done: change the characterset on pages, add an advanced searchbox and of course add a few more reviews. Watch this space in the next couple of weeks!